I would rather chew tin foil and listen to nails scraping across a blackboard than do my taxes. But every year as that ineluctable tax deadline looms, online software preparation packages try to convince me how easy�almost fun�doing your taxes can be with the right help. So this year, I decided to feed my journalistic curiosity (and an apparent masochistic streak) and do my taxes online not once, not twice, but three times. The goal was to assess three of the most popular online programs�TaxAct, TurboTax, and TaxCut�and see just how easy or painful settling with the IRS can be. TaxAct entices filers by offering a �free� basic program for filling out Federal returns. True, the IRS allows anyone with an adjusted gross income of less than $52,000 to file for no charge online using its Free File service, but I was looking for more hand holding to get me through the process. TaxAct's interview process offered some extra comfort. The free standard edition of TaxAct (online or available as a download) walks you through the process in a typical question-and-answer format, which obviates the need for filers to go through each IRS form, wade through all the instruction booklets, and figure out which 1040 form and schedules to use. TaxAct determines all that for you based on your answers. TaxAct's questions and instructions are generally clear enough. Each section is listed under different tabs (income, deductions, etc.) across the top so you can easily go back to an answer to make a change. The software also keeps a running tally of what you owe or what your expected refund will be so that you can see how what you enter affects the total. The program also catches a variety of errors and mistakes. For example, it corrected me when I mistyped an employer's identification number from a W-2 form. For other sorts of miscues there's a review process at the end that alerts you to various errors or possible mistakes. TaxAct's alerts noted that I failed to enter the type of vehicle used in my business and that I may owe an underpayment penalty. Another alert pointed out that I'd made an error in the child care expenses section, but it was unclear what I'd done wrong and it didn't automatically take me to the right place to fix it. TaxAct provides various alerts at the end of the interview process warning you of possible errors. If you want more help, TaxAct offers an online Deluxe version for $7.95 (a version with state filings costs $15.95), which includes expert advice along the way, free phone support, and other information, such as a comparison of your taxes with national averages. And TaxAct won't let you forget about the Deluxe version. During the Q&A process, I was asked no fewer than 15 times if I wanted to spring for the upgrade. Furthermore, every highlighted, hyperlinked word, which I expected would take me to a helpful definition, instead took me to another pitch for the advice offered in the Deluxe edition. While such interruptions shouldn't be a surprise in a free program, what I did find objectionable was that TaxAct takes the Q&A format to the extreme. It took me nearly a dozen screens to fill out basic W-2 information (other programs do it all on one screen). Reporting dividend income was also a multi-screen process. I also found TaxAct's terminology occasionally caused confusion by failing to match exactly what was on, say, a 1098 form. And the free online help documents are not very helpful; they usually refer you to specific numbered lines on the IRS forms but TaxAct doesn't supply the corresponding numbers alongside the questions. In spite of the criticisms, or rather because of them, TaxAct is best for people with the simplest returns who are just looking for the most straightforward way of making the April deadline. Taxpayers looking for more options should check out TurboTax, which is from Intuit, the makers of Quicken. TurboTax offers a dizzying array of options, ranging from a basic online Federal filing program for $14.95 to a Home and Business version for $74.95. State forms cost extra, usually $11, and you can even choose a $34.95 Audit Defense option. The latter feature means that should you get audited, Intuit will represent you and handle all the details and communications with the IRS. I tried out the basic $14.95 program and found it sufficient�and sufficiently lucid�to handle the needs of most filers. 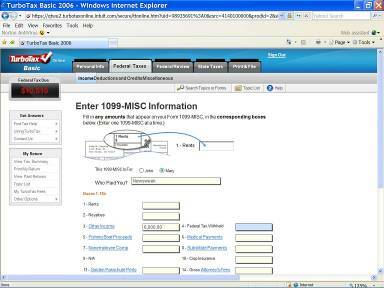 Its interface is slicker than that of TaxAct and includes niceties like automatically filling in the slashes for dates. Its question-and-answer process is also friendlier in many respects. 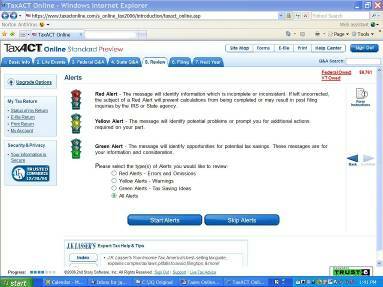 The program also prepares you for what's ahead, for example, by warning you about some forms you'll need. And neophytes will find the questions are extremely helpful. For example, when it asks you if you received any 1099 forms, it shows you an example of the form on the screen and tells you who is required to provide you with such a form. And when it came time to claim vehicle expenses, the program's explanation was relatively straightforward and even warned me to check how I had claimed such expenses in previous years. TurboTax neatly puts all the information from a single form, such as a 1099, on a single screen. Entering data in TurboTax is also easier. You can import tax related expenses and information from Quicken for Windows 2005 (or later), for example, and the program will automatically import investment information from scores of national brokerage and investment sites ranging from A.G. Edwards to Wells Fargo. 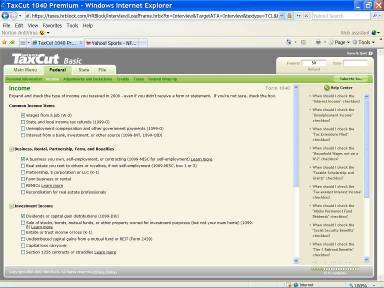 TurboTax also lets you enter all the information from a single form on a single screen, including W-2s and 1099s. I also found TurboTax also did a remarkably good job addressing queries. Its �explain this� highlights offered lucid yet brief explanations of terms like �straddles� in the investments section. And questions submitted to the help section usually returned results that were, well, helpful. In addition to a running tally, the program also keeps track of your progress (�we've covered 1 of 22 income topics��ugh) and provides a summary after each section with a button to revisit a section if you notice something awry. Not all was perfect, however. While TurboTax did catch a problem where an employer took too much social security tax and told me how to request a corrected W-2, it missed some information that I intentionally entered incorrectly, such as incomplete addresses, proving that no tax software is idiot-proof. Before there was TurboTax there were the friendly H & R Block offices. Over the years, the company has done an admirable job catching up to Intuit with its own program, TaxCut, for people who would rather file online than face a human tax preparer. TaxCut comes in 3 different flavors. A basic program for Federal returns is $9.95, a Premium package with more guidance for investors and the self-employed for $19.95, and a Deluxe version that includes state filings for $39.95. I tried the basic online offering. To start, the program will import the previous year's tax information from TaxCut or TurboTax, if available. And its business-like interface does an excellent job enumerating all the documents you might need; its list is more comprehensive than even TurboTax's list. Furthermore, you can print the list of necessary documents so that you can take it with you as you forage through files and shoeboxes in the attic. TaxCut asks all initial income questions up front, rather than making users finish one section before asking about the next category. Such thoroughness extended to the interview process. TaxCut was the only program, for example, to not only check my state of residence but to also ask up front if I worked in other states during the year (I did). It also handles the question-and-answer process differently from the other two. It asks you to list all possible sources of income on a single page up front, for example, rather than having you work through each one individually and then asking you whether you had other income, such as from dividends or a small business. Ultimately, those who want to know what every little entry means will be happier with TaxCut. It has a page-specific list of frequently asked questions and answers along the right hand side of each screen, and the program covers more ground in terms of providing explanations. On the W-2 page, for example, there's an explanation of what is in each and every box on the form, which is more than the other programs provide without a lot of digging. Even the best tax preparation program can't make the process easy or fun. But all three programs here are certainly worth the time and cost compared to working your way through the IRS forms on your own. All three were up to date, as well, including such recent changes as the application for the Telephone Excise Tax Refund. Consequently, all three told me I owed the IRS the same amount of money (don't ask), within a few dollars of each other. If all you do every year is file a 1040EZ without itemizing deductions, TaxAct's free program is sufficient. For everyone else, TurboTax and TaxCut are better choices, although I prefer TaxCut's advanced-warning approach. Should you like to embark on an experiment similar to mine, all three programs allow you to work on your return online for free until you decide to file the forms electronically or print them out. And while I didn't encounter any loss of data due to system crashes or site delays, if you want a similar trouble-free experience, I recommend that you don't wait until the last night to file your taxes online.